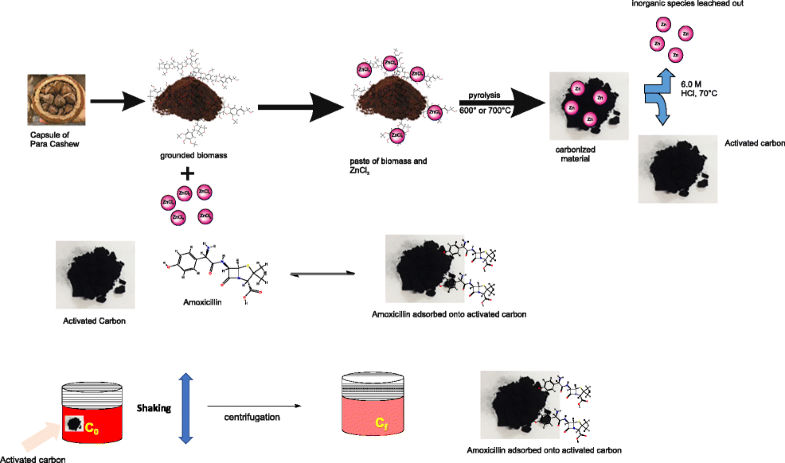 High-surface-area activated carbons were prepared from an agroindustrial residue, Bertholletia excelsa capsules known as capsules of Para cashew (CCP), that were utilized for removing amoxicillin from aqueous effluents. The activated carbons were prepared with the proportion of CCP:ZnCl2 1:1, and this mixture was pyrolyzed at 600 (CCP-600) and 700 °C (CCP700). The CCP.600 and CCP.700 were characterized by CHN/O elemental analysis, the hydrophobic/hydrophilic ratio, FTIR, TGA, Boehm titration, total pore volume, and surface area. These analyses show that the adsorbents have different polar groups, which confers a hydrophilic surface. The adsorbents presented surface area and total pore volume of 1457 m2 g−1 and 0.275 cm3 g−1 (CCP.600) and 1419 m2 g−1 and 0.285 cm3 g−1 (CCP.700). The chemical and physical properties of the adsorbents were very close, indicating that the pyrolysis temperature of 600 and 700 °C does not bring relevant differences in the physical and chemical properties of these adsorbents. The adsorption data of kinetics and equilibrium were successfully adjusted to Avrami fractional-order and Liu isotherm model. 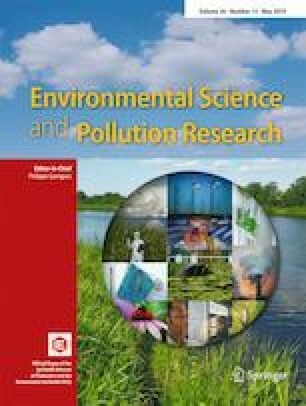 The use of the adsorbents for treatment of simulated hospital effluents, containing different organic and inorganic compounds, showed excellent removals (up to 98.04% for CCP.600 and 98.60% CCP.700). The online version of this article ( https://doi.org/10.1007/s11356-019-04994-6) contains supplementary material, which is available to authorized users. We are also grateful to Chemaxon for giving us an academic research license for the Marvin Sketch software, Version 19.2.0 (http://www.chemaxon.com), 2019 used for molecule physical-chemical properties. The authors thank the National Council for Scientific and Technological Development (CNPq, Brazil) and Coordination of Improvement of Higher Education Personnel (CAPES, Brazil) for financial support and sponsorship.